In time for the latest World of Warcraft Expansion: “Legion,” author William King explores one of WOW’s most infamous villains. “The Betrayer”—Illidan Stormrage—is on a search for power while struggling against a seemingly invincible demonic force. This is the third Warcraft book under my belt, and I continue to be impressed by the quality of each novel. Written by a wide variety of good authors, each has been both enjoyable and accessible to someone having just started his ventures through the lands of Azeroth. Illidan seems especially welcoming to anyone willing to travel through the fantasy book. It’s obvious that the new story is meant to pump up longtime fans for the addition to the latest game, and at the same time, welcome those who are new to Warcraft. Be forewarned, the book isn’t an introduction. There will be lore that if you are new to Warcraft or know nothing of the universe, will mean nothing to you. King has an interesting plot to work with as well as interesting characters at his disposal. 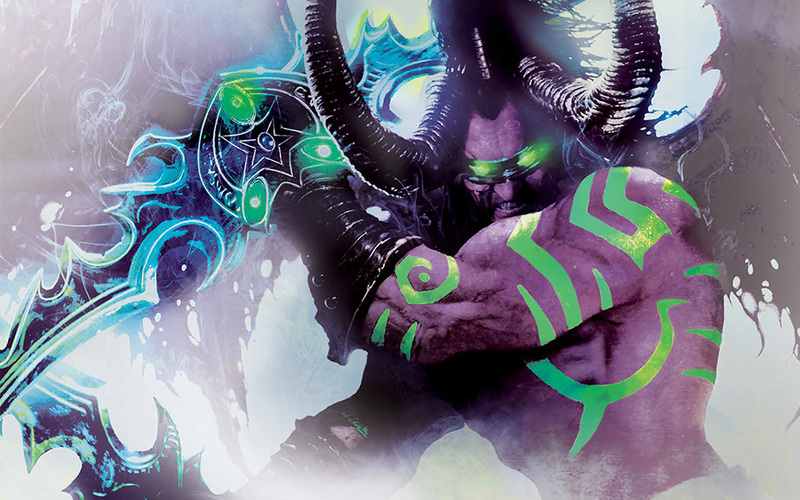 Primarily, Illidan is a force to be reckoned with, but without ever exposing the elements that would make the character less cool, King forces readers to examine different elements and motives behind the main character’s actions. Like many other well-rounded characters that round out the plot, no one is as good or evil as they seem. For example: Illidan is full of evil and savagery, but he’s just the right kind of savage to potentially take down the “Burning Legion” a demonic force that threatens worlds across time and space. They are painted as death incarnate, sweeping over the most powerful civilizations with near ease. And so, while our protagonist is rarely shown in an admirable light, his actions and intentions seek to save the world. At the same time, night elf Maiev Shadowsong, Illidan’s former jailor, seeks to either enslave the villain once more or kill him to end his treacherous deeds. Her heart is in the right place, but neither she nor practically any of the other characters appear willing to entertain the idea that Illidan may be a force for good in the upcoming war. Maiev is consumed by her vengeance, so much so that King often toys with the concept of it turning her into a mirror of the very creature she hunts. There’s also Vandel, a night elf who turns to Illidan for the power to avenge his family after they were murdered by the Burning Legion. The character allows us to understand the evolution Illidan must have gone through as we witness Vandel’s transformation through the use of dark arts. Throughout, we sympathize with the character’s want for vengeance and instead of simply turning him into a monster, we can continue to like him even though his story and the accompanying plot turns darker. The tension builds nicely as the reader is aware of the impending doom that seems imminent with each chapter. In addition to well-written characters, action is well described and exciting. The machinations of this fantasy world’s battles are intriguing and unique. The way the action is implemented consistently leaves one wondering if Illidan might truly prevail in order to stop the coming apocalypse. It is during all of this that we come to understand characters as they are put to the fire. It’s the grey area that helps always keep the story interesting, not necessarily passing judgement, merely showing us who characters are, warts and all. Any problems I had with the novel come down to length. It’s roughly 336 pages and is slow at times. There’s also the matter of some fantasy mumbo jumbo that I glanced over, but found that it hardly limited my enjoyment of King’s work. A lot of fun to read and perhaps a great start for anyone interested in Warcraft. It certainly helps fill you in on key events that will further enjoyment for the game’s expansion. King could have made things too cut and paste. Instead, there’s a vividness to his writing and a thoughtfulness that makes this a fantasy novel worth supporting.